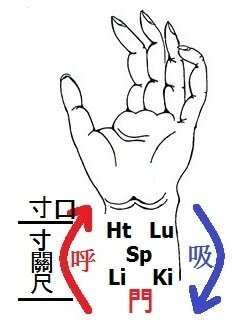 First difficulty of Nanjing explains that cunkou is connection of meridians with external Qi source, it is a reason that practitioners observe fifty yin and yang periods created by rotation of the earth. Cunkou has not control over internal organs, this function is of chicun, which controls yin and yang. Difficulty 8 explains that gate between kidneys controls breath as it is between inhale and exhale. Interruption of inhale and exhale of pulse breath will not affect connection with fifty yin and yang periods, so cunkou will be marking these astronomical changes as before. Interruption between inhale and exhale will affect areas controlling yin and yang, so it will be reflected in chicun. It is not only one difficulty of Nanjing indicating< that cunkou doesn't show pathology. Function of cunkou is indication of external astronomical qi with yin and yang meridians during fifty yin and yang periods. It is a reason that difficulty says that pulse of cunkou will be even, not healthy, as difficulty 21 says. These differences are of primary importance for practitioners of archaic acupuncture, as practitioner uses chicun for diagnosis of affected meridians and cunkou to find which of meridians is open for astronomical influences. Chicun is a diagnostic tool and cunkou is a astronomical clock which is marking astronomical events, not events of the body.